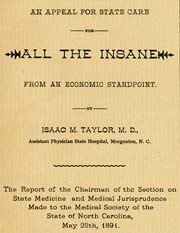 Isaac M. Taylor An Appeal for State Care for All the Insane from an Economic Standpoint. The Report of the Chairman of the Section on State Medicine and Medical Jurisprudence Made to the Medical Society of the State of North Carolina, May 28th, 1891. An Appeal for State Care for All the Insane from an Economic Standpoint. The Report of the Chairman of the Section on State Medicine and Medical Jurisprudence Made to the Medical Society of the State of North Carolina, May 28th, 1891. Wilmington, N.C.: Jackson & Bell, Steam Power Presses, 1891. Insanity -- Law and legislation -- North Carolina. Mental health laws -- North Carolina. Mentally ill -- Care -- North Carolina -- Finance. State hospitals -- North Carolina -- Finance.